To select editable type characters, you must use the Type tool. 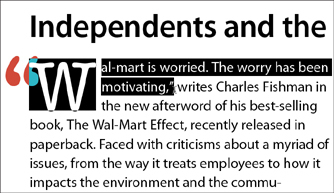 Click an insertion point in any text frame with the cursor, and then highlight the characters by clicking and dragging over them (see Figure 1). Figure 1. To select individual type characters, click and drag over the text with the Type tool. Double-clicking selects a single word. Triple-clicking selects a line if the Triple-Click to Select a Line option is enabled in Type Preferences; otherwise, it selects the entire paragraph. Clicking four times selects the entire paragraph if the Triple-Click to Select a Line option is enabled; otherwise, it selects the entire story. Clicking five times selects the entire story when the Triple-Click to Select a Line option is enabled in Type Preferences. The shape tools in InDesign enable you to create rectangles, ellipses, and polygons. You can also create lines with the Line tool and draw freeform shapes with the Pencil tool. To create custom paths and shapes, you can draw and edit points using the tools available in the Pen toolset. You can access the Line tool by clicking its icon in the Tools panel or by pressing the back slash key (\). InDesign enables you to draw both diagonal and vertical or horizontal lines with the Line tool. Hold down Shift as you draw to create a straight, horizontal or vertical line, or to draw at 45° increments. To draw lines at other angles, just click and drag in any direction. Lines drawn with the Line tool are easy to work with in that they have only two points (one on each end). You can adjust a point by selecting it with the Direct Selection tool and repositioning it. You can also add points to a line by clicking it with the Pen or Pencil tools. In addition, you can move lines with the Selection tool, rotate them with the Rotate tool, and scale them with—yes, you guessed it—the Scale tool. The default stroke settings for all new lines that you draw with the Line, Pen, or Pencil tool is 1 pt. stroke width and a solid black stroke color. To change the application default setting, close all documents and adjust the point size and stroke style in either the Stroke panel or Control panel. All new lines that you draw will then take on these characteristics. To draw a rectangle, ellipse, or polygon, choose the appropriate frame or shape tool and click and drag. If you hold down the Shift key as you draw, it constrains the overall proportions of the shape, making a rectangle a perfect square and an ellipse a perfect circle (rather than an oval). Holding down Option (Mac) or Alt (Win) enables you to draw the shape starting from its center point. There are two ways to create rectangles, ellipses, and polygons with the shape and frame tools—by drawing them with the tool or by entering Width and Height settings into the respective tool’s dialog box (see Figure 2). You can access the settings dialog box by clicking once on the Pasteboard with the tool. After you enter the preferred settings in the dialog box, click OK for the shape to appear in the same spot that you clicked with the tool. Figure 2. The Rectangle dialog box. Figure 3. The Polygon Settings dialog box. You can also access the settings dialog box for the Polygon or Polygon Frame tool by double-clicking the tool’s icon in the Tools panel. InDesign automatically applies default stroke settings to your shape, but you can adjust them in either the Stroke panel or the Control panel. You can also add a fill, place a graphic, add some text, apply an object style, or use the Pathfinder controls to merge with other shapes. If you’d like to change your shape entirely without having to redraw it, use the Convert Shape commands located under the Object menu or in the Pathfinder panel. When drawing a polygon shape or frame, press the up-arrow or down-arrow keys as you click and drag to increase or decrease the number of shapes you create. 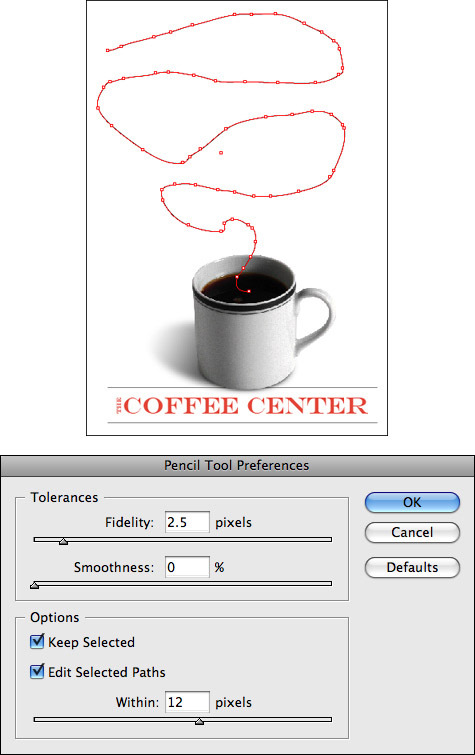 Using the Pen toolset, you can create custom drawn shapes just as you would in applications such as Adobe Illustrator or Corel Draw (see Figure 4). Figure 4. A custom shape drawn with the Pen toolset. To start, press P to access the Pen tool, then click and drag to create a series of connecting points that result in a custom-drawn shape. Clicking with the Pen creates a point, and dragging with the mouse creates its curve in relation to the previous and next points placed on the path. Every curve contains its own set of control handles that you can also adjust. Using the Direct Selection tool, you can move and modify points, segments, and control handles. You can create a corner point by clicking an anchor point of a curved path with the Pen tool immediately after drawing it. Then press the Option/Alt key and drag to create a new control handle that is facing in a different direction. Click and drag again to create the next curved segment of the path. You can move an anchor point and its handles as you are drawing with the Pen tool. To do so, click to create a new point, hold the mouse button down, and then press the spacebar to move it. To create a freeform shape using the Pencil tool, press N to access it from the Tools panel and begin drawing. 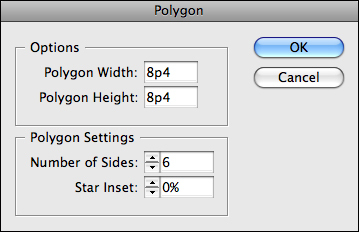 As you draw, InDesign calculates where the points should fall on the path and places them for you. You can then switch to the Pen toolset and adjust the placed points, or use the Smooth and Erase tools to edit the path. If you enter specific settings in the Pencil Tool Preferences dialog box before you begin drawing, you can eliminate the need for editing and smoothing of points later. To access the dialog box, double-click the Pencil tool icon in the Tools panel (see Figures 5 and 6). Figure 5. Lower Fidelity and Smoothness values result in jagged paths. Figure 6. Higher Fidelity and Smoothness values result in cleaner paths. The Smooth tool has a similar set of preferences that you can access by double-clicking the Smooth tool icon in the Tools panel. When drawing with the Pencil tool, you can temporarily access the Smooth tool by pressing Option (Mac) or Alt (Win). By drawing with the Pencil tool, it’s easy to create open path shapes. To close a path quickly, select it with either selection tool and choose Object, Paths, Close Path, or click the Close Path control located in the Pathfinder panel.